The northern hemisphere has always been traversed by ice ages. In reality, there were more cold years that warm years, as summarized in the following graph. We are clearly in interglacial (warm) period since -10,000 . The glacial periods (which have very different names depending on their geographic locations where their signs are observed, even if it is the same phenomenon at the scale of the entire world) and inter-glacial are governed by solar and astronomical complex cycles, and they cause violent change on Earth’s climate, as demonstrated by the Serbian astronomer Milutin Milankovitch between 1920 and 1941. Comparison between the curve of solar radiation at latitude 65 ° (top) and the curve of temperatures calculated from the ratio O-18/O-16 ice at Vostok, Antarctica (bottom). The two last glaciations (Weichselian and Wolstonian) were even colder than the preceding two glaciations. Wolstonian Glaciation is almost bonded to the previousglaciation (Kansan), since the interglacial period that separates them is very short. Glaciers have the time to melt only a little, and the volume of ice does not reach the usual minimum. In Wolstonian glaciation, temperatures reach their lowest three times (it was about -190,000, -160,000 and -140,000), against only once in the previous two (it was about – 340,000 and 240,000) and twice in the Weichselian glaciation (it was about -70,000 and -20,000). In Wolstonian glaciation, temperatures reach their lowest three times (about -190,000 years, -160,000 years and -140,000 years), against only once in the previous two (about – 340,000 years and -240,000 years) and twice in the Weichselian glaciation (about -70,000 years and -20,000 years). It is important to consider all these parameters, because we can so understand how much the “Out of Africa” theory is absurd. This theory never gives the cause of the so-called modern human exodus from Africa. It claims probably, as evolutionism wants to, that humans from Africa was shaken by such evolutionary change (but which one?) that they had a sudden urge to migrate to north for about 50,000 ago, in the middle of ice age, while the climate of France was roughly equivalent to current Siberia, tundra and taiga, while the Middle East and north Africa was a pleasant oasis covered with deciduous green forest. Believe it is absolutely unreasonable. There are no species adapted to the African climate that would have committed such a crazy project. However, there are many species from the northern hemisphere that have the migratory instinct in them. Whether seasonal, or larger cycles. This is the case for example for many migratory birds from Europe such as greylag geese and some swallows, whose no longer migrate to Spain or Africa in winter since the climate became warmer, the temperature being sufficient to them further north. The migratory instinct is well known – and entirely probable – among Neanderthals, since it is assumed that they followed their usual prey among others, as the reindeer and the mammoth, according to the specific movements of the latter. It is therefore obvious to think that this species took refuge here during the coldest periods, an assumption which is not popular, archaeologists preferring probably to think in a purely geographical and cultural way. The European barrier becomes necessarily a cultural barrier, they think, as now in our modern sedentary societies, and although everyone knows that peoples of the Stone Age were nomads. Thus, JJ Hublin claims that Neanderthals disappeared because they probably lived in small groups on a small geographical area and they were dying of cold and hunger. No earthly creature behaves thus, and many even manage to adapt to the whimsical behavior of modern man. It seems particularly inappropriate to think that Neanderthals would suddenly behaved thus when he has survived several ice ages before. Note that they lived in Byzovaya (presently in Siberia) in full ice age (around -28,500), and probably during the winter (? currently no proofs), according Ludovic Slimak, a researcher at CNRS in the program Le Salon Noir on french radio France Culture(22.06.2011). Modern winters (in inter-glacial period, warm also) in this region displays a nice -40 ° C during 4 months. For example, I made a pedestrian route on Google Maps, from Paris to Israel’s border, which gives me about 4300 km, or 35 days and 15 hours. With an average of 5km a day and some holidays, it will be about 3 years. Obviously, no one walks days and nights. They must have time to live, eat, defend themselves if necessary, to bear children, etc. Anyway, the goal was not to go to Israel or to move as fast, but to move step by step with changes and climatic disadvantages, over several centuries. I take this example to expose to the eyes of motorized sedentary humans we are that this is clearly and fully possible, and that to claim the opposite (Hublin) is quite absurd. 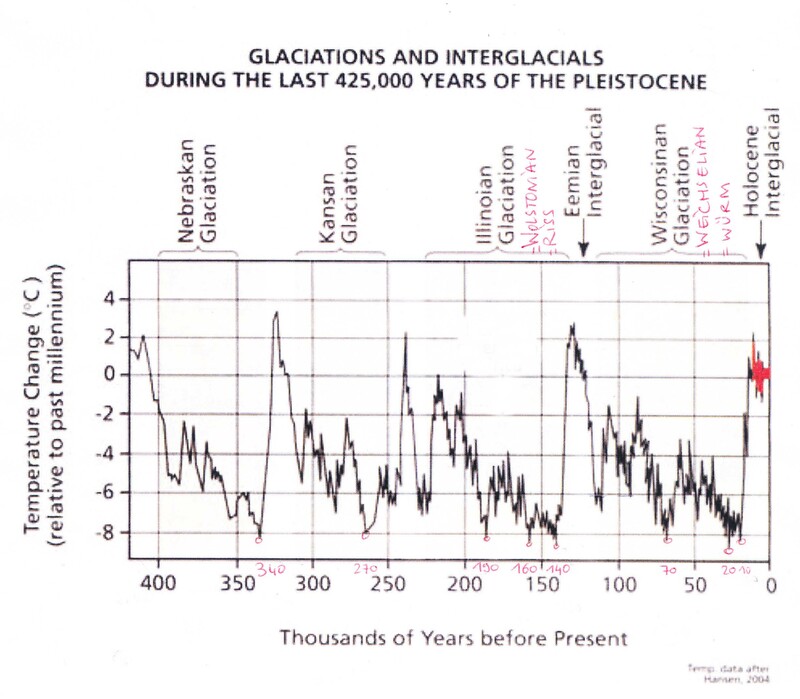 Let us now look at our graphics and the particularly harsh glacial period called Wolstonian or Wisconsinan (in America), and the one before (Kansan on the graph), since they are almost only one. In 200,000 years, the minimum temperatures of the Pleistocene have been reached four times, which is considerable. It seems clear that Neanderthals were particularly weakened. Even if Neanderthals could live in Byzovaya in -28500 in full ice age, it is not certain that it was an example of a whole group (men, women, children) *, and it is obvious that the mildest circumstances in the south have attracted them. They moved further south to the Israelis sites, then covered with forests. * NB! I will mention that below, but the question of temperature is not the only one that play a role in population displacement. The solar radiation, which it does not fully bound with temperature is crucial. In – 28 500, the solar radiation was pretty high for such low temperatures, and this certainly played a positive role in the peopling of the far north. You can compare this situation to the current and well-known situation of polar bear. The conditions of its environment have been degraded (from its point of vue) dramatically. This species has entered a survival mechanism. I think it was the same for Neanderthals whenever the temperature fell very low, especially when the solar radiation also was low (too little solar radiation causes rickets, lower growth and thus a smaller size, an increase in disease). It occurs then the survival mechanism of the species, which drove them not only to move, as this is also known in warmer weather, but also to hybridize to the humans from the South just like the polar bear hybridizes to brown bear. The fair genes are recessive in the hybrid and are ready to emerge again when the climate will be favorable, if the species became extinct between time. Polar bears and grizzlies are closer than Neanderthals and Sapiens, but the comparison is interesting. The grizzly, named like this because of its gray color, sometimes brown and sometimes blond had a common ancestor about 200 000 years ago with the polar bear. 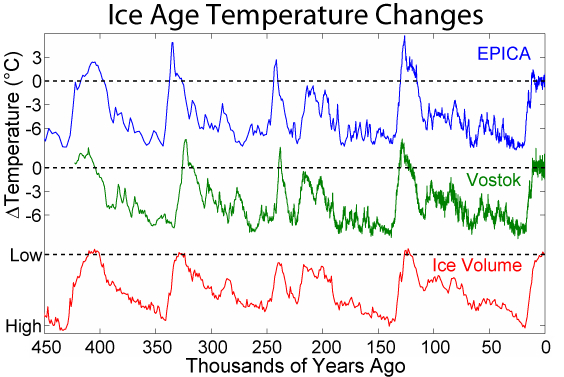 200 000 years is also the period when the ice extent in the northern hemisphere was a longtime low. It is now even lower, and this has been so for 10 000 years only, but we must also consider the role of humans in the polar bear habitat to understand that the modern critical situation in which it finds itself was approximately equivalent to that that lasted from – 240,000 to – 180,000 years. The pizzly, a hybrid between a grizzly and polar bear, is almost gray. It is less suited to the ice, but more adapted to life on land. Hybridize with the grizzly is an instinctive way for the polar bear to keep the genes of its species. It is probable that the white genes form gradually a “recessive package” as it is known in many species of animals, including the Kermode bear (or « Spirit Bear »), which was considered among American Indians as a relic of the last glaciation. 10% of black bears there are born white (genetic studies have shown that this phenomenon is caused by a package of recessive genes), and this color is probably the remnant of a died species but saved and who lived there at the last ice age. 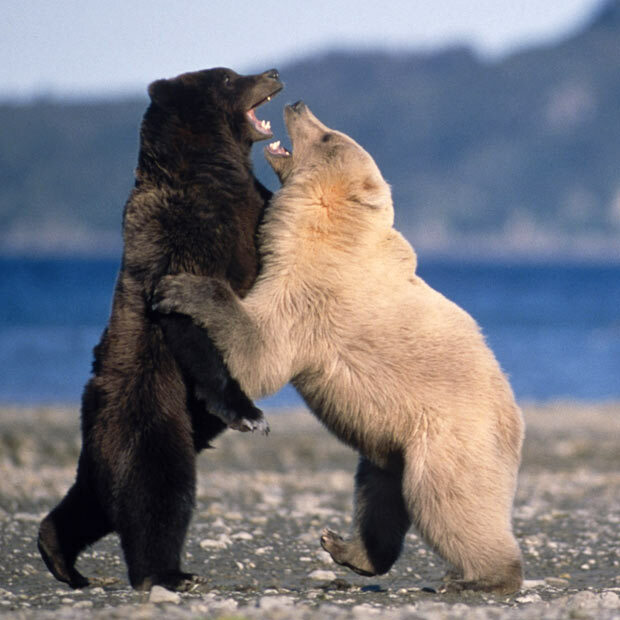 This bear has, by this survival mechanism, hybridized to his black neighbor, to “freeze” its species until the next ice age, in which the white coat is essential. In ancient times, there was a legend that every tenth bear was turned white as a reminder of the hardships of the last ice age, a pronouncement that the Spirit Bear would live forever in peace. This mechanism is dangerous for the species, but it may thus be essential to its survival, and that’s probably why it exists. It is likely that if the polar bear would disappear, this “white genes package”, called leucism or leucitism, which is found in the grizzly / pizzly would appear occasionally. The grizzly, who is a subspecies of the brown bear, is almost certainly already a polar bear / brown bear hybrid as suggested by its habitat, that it shares with the polar bear, its massive size compared to the classic brown bear, the shape of his head, and its coat that ranges from blonde / gray to dark brown. In this sense, it is a genetic reserve for the polar bear, which makes possible its hybridization and limit the damage it would cause (genetic incompatibility, too different size, etc..). As polar bears exists, and as long as it is not extinguished, it is probable that the mixtures are not consistent enough or old enough to form this « white genes package » or leucism in another species, as Kermode bear, white tigers, white lions, white deer, white deer, white blackbird, white peacock, and other animals with this recessive so-called “anomaly” that is classical in animals of the northern hemisphere or mountainous regions, who suffer dramatic climate changes in during glacial periods. Note also that the animals are often larger leucistic, including the tiger, which gives them an advantage in cold climates. In humans, it is possible to find blue-eyed and blonds Mongolian for example, without they having any blue-eyed and blonds parents. If the leucistic population, like Kermode bear, able to live in the northern hemisphere or in mountain areas during ice ages disappeared whenever the climate of their habitat were transformed, as it is frequently the case, we can understand that these areas would be quickly drained of all life, and they would have been empty a long time. By this system they assure the protection of their species until they again become favorable climate. The leucitisme or leucism is the stigma of this survival mechanism. It is possible to imagine that these genes may become dominant if solar radiation decreases, as a variable coat with large cycles. Concerning such cycles, we note that the size of the cave bear increased during glaciations, and decreased during inter-glacial (warm) periods (http://fr.wikipedia.org/wiki/Ours_des_cavernes); for better known variable cycles, we can mention the arctic fox, arctic wolf, ptarmigan, arctic hare or alpine hare, etc.. While the white coat (or white skin) can be a disadvantage in interglacial period (and recessive) it is very useful in ice age (camouflage; or in humans in particular, less filtering of the very useful solar radiation when it is less), and it could become dominant. This is an hypothesis, but it is probable that these individuals or populations have a special attraction for the northern regions and mountains, in order to repopulate them, as the very easy example of Scandinavian. So I will choose a totally different interpretation of anthropology and geography. Scandinavians are not blonde because they live in the north, but they live in the north because they are blond. Here’s why you’ve always loved skiing, and why many Europeans have a very special affinity with the snow, they miss as soon as winter is a bit hot. I do not believe in psychology and that we are attracted by the snow because it would remind us nostalgic cold winters of our childhood. First, the winters have not all been cold, and childhood has not always been sweet. I believe in the power of DNA, the Platonic thumos in the soul, which dictates what is good for us, depending on our environment. It is clear that such micro-evolution exists, but what is called a mutation, however, is probably often either a direct hybridization or a past hybridization which has left recessive marks, which are able to reappear. It is still necessary to clarify that the hybridization between the bear is different from the hybridization between humans, even if it is comparable. While the polar bear is perfectly adapted to the coldest climates, and while it is the interglacial that kills it, the Neanderthal is adapted to cold climates, but moderately cold. An inland ice sheet too big, a too low temperature, and too little solar radiation cause damage to him. It was thus “threatened” during the coldest and less sunny periods of glaciation, and he has migrated southwards. What is strange is that we think in an entirely different – and much more logical – way when it comes to animals. Nobody is surprised if a breeder of Samoyed dog tell you that these dogs become other dogs in the first winter snow, and that they roll in the snow with happiness. Here there is no question of psychology and childhood, this seems obvious. Similarly, no one will tell you that the kittens are jealous if they fight, no one will bother you with this unfortunate Freudian Oedipus complex if they growl in front of their father or mother, they will tell you that they learn to hunt, and at worst that they learn the hierarchy imposed by their species. Sometimes it is good to look at the human being as an animal. This to a certain degree. Human is an animal, but a particular animal. This singularity is the weapon that nature has given him to him. Human has no long canines, he is not very large, he is not very fast, he is not very quiet, he has no shell, but he has his head. This is where everything changes, and that is why this hybridization has great implications for the Neanderthal species, or the European species that we are, at least on our scale of modern humans of the second millennium. We know that Neanderthals had a hard life, it is assumed that women were few, and this seems logical, since they appeared to more or less participate in hunting too, (it was found Neanderthal women with serious fractures, such the woman from St. Cesaire, called “Pierrette,” -36,000 years – she had a severe skull fracture), and since women have an additional disadvantage to survive compared to men, since they are more fragile and have to go through periods of pregnancy and childbirth that are particularly dangerous, especially in cold climates. It is likely that Neanderthals, who was also stronger than Sapiens Sapiens have taken a few women. The reverse is rather unlikely, when we see the inequality of force between the two species, and the results of studies on mtDNA we discussed earlier. These hybrids have probably occurred a long time, probably every time the temperature and / or the solar radiation was low, and the ice level was high. Neanderthals migrated southwards, seeking warmer temperatures. Thus, already in -340 000 we can imagine a hybridization. It was probably insignificant, and the resulting hybrid had probably a poor fertility, especially men, who might be sterile, as in many animals (see previous article). Offspring was anyway born, probably through the female hybrid, and it built the archaic “Neanderthal” Homo sapiens that I have listed in the preceding article. Some remained in Africa, and their blood was diluted in the African blood in the Middle East and in Ethiopia. Some others went away to Europe, perhaps instinctively, during the warming that followed. This may have slightly modified the appearance of the Neanderthal, but at this stage, the share of hybridization was too small to be meaningful, and most hybrids have probably given little or no offspring. In – 270 000, temperature reaches again its minimum, and Neanderthal is again in serious danger. New migration, new hybridization, probably slightly easier, since the sapiens in Ethiopia and in the Middle East had a little Neanderthal blood, but still very small and almost insignificant. 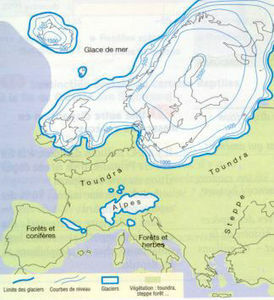 After that, the climate was not warmed up clearly, but it happens a moderate and different inter-glacial period, glaciers are melting less than usual, then the ice age arrives, with three times with very low temperatures instead of only one, the one after the other, and a low level of solar radiation also three times. Neanderthal is severely weakened, and the entire species is endangered. Neanderthals, mostly women, die young, and the survival mechanism of of the species is again established: three migrations, three hybridizations, in – 185 000, in – 160,000 and in -140,000 . The so-called « modern Archaic Homo Sapiens » appears slowly in Ethiopia and in the Middle East. It is actually a early Neanderthal / Sapiens hybrid. A Cro-Magnon of Wolstonian glaciation. Then comes a classic inter-glacial period. Some hybrids remain in Asia / Africa, others go back to the north and the Neanderthal blood is already changed. A new ice age arrives and the temperature decreases dangerously around anno -120,000, and the solar radiation reach its minimum again and then around anno – 90 000 , and part of the Neanderthal species migrate south. Here, it becomes Tabun (-120,000 ) and Skhul and Qafzeh (-100 000 to -90 000), previously attributed to Neanderthals, and then returned without explanation – if not the lack of physical evidence of the so-called and famous “Out of Africa” theory – in archaic Homo Sapiens. It is in Skhul and Qafzeh, located in current Israel, that is the key to history. In Skhul, Qafzeh, Amud and Tabun are the first outstanding true hybrids, and not the first homo sapiens who appeared suddenly in Israel. We will return to this subject, and detail their characteristics in the next article. Some of these hybrids would again moved northwards around anno -60,000 when the climate was becoming a little warmer, and they would be mixed on site with the Neanderthals, some of whom lived to the limit of glaciers in the north, as in Byzovaya, located today in Russia. Do you think that this can explain why many African people nowadays don’t live as nomads although this could make it easier for them to survive? Maybe they never had to move during the ice ages and now they don’t have this travelling instinct. It has always appeared odd to me that they just keep living in regions that got dried out by agriculture or polluted by oil-companies. 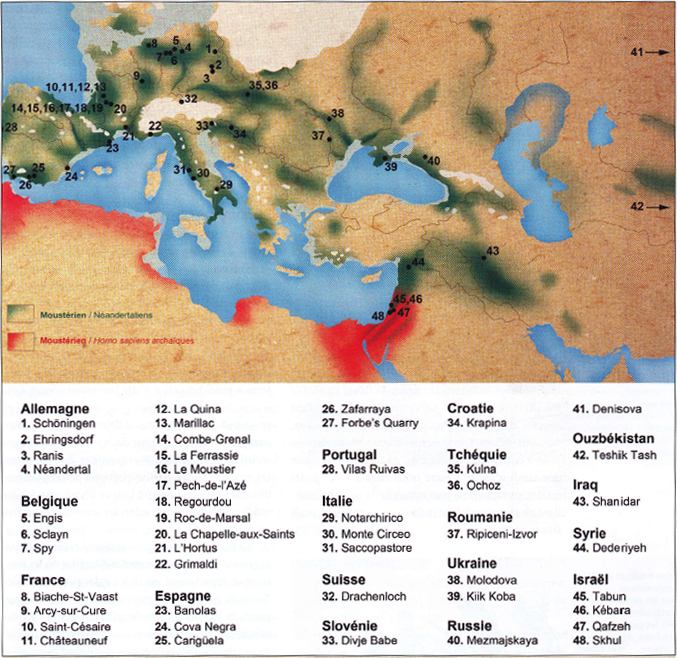 great post .i really like the way u writing and tell about the truth .For those who are interested to obtain information about the migration of Aryans in that hard winter .i suggest you read the Avesta is the oldest written document in the context of the story it is described as nomadic Aryans. A very important post explaining the fallacy of the ‘Out of Africa’ theory. Веома важан пост који објашњава погрешност теорије “Из Африке”. Maybe I am a bit old fashioned, but I long for the day when, as with much of Varg’s writings, I can sit down with this treasure trove of information in book from. I have never really come to terms with the Internet and do struggle a bit, again probably a generation thing.